I realized that I forgot to mention the deadline for the giveaway. You have until Friday the 24th at midnight to post a comment on my previous post in order to enter. Remember to come back to the same post and comment again if you mention it on your blog, in order to be entered twice. Don't forget to leave your email address in your comment or a link to your blog. Also, there has been some confusion and I want to clarify that it's the "Beloved" painting that is the giveaway and not the "Sugar Plum Bakery" painting. The giveaway is an actual painting and not a print. Recently I shared with you my daughter, Amber's, blog. Now, it seems as though everyone in the family wants their own blog. 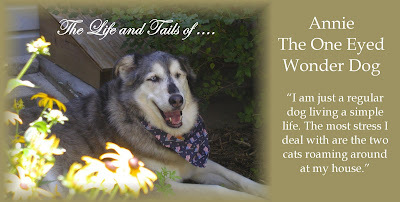 Our dog, Annie, with the assistance of my hubby, Rick, has started a blog of her own. You can check her out here. You dog is a cutie! I'll have to check out the dog blog! Sweet dog! Which reminds me that I haven't followed links too well of late. How sweet and cute is your dog. I love that your doggie had a bloggie.. I will make sure I stop by. Annie is beautiful, and I like her blog!